Lentil meatballs are a delicious, hearty vegan alternative to meatballs. These lentil meatballs are tender, full of flavor and filling. Looking for more traditional meatball recipes? Check out my recipes for Italian Meatballs, Chicken Meatballs, Instant Pot Meatballs, or Swedish Meatballs. And so does my entire family–but my little girl only likes meatless meatballs. Hence the need to create a meatball that is delicious, hearty, and meat free. These lentil meatballs are not only meat free, but they happen to be vegan as well. But most importantly they are full of INCREDIBLE flavor. Lentils really are a great substitute for meat in so many dishes, as they are full or protein and have a great hearty texture. Lentils also come with the added benefit of being gluten-free, full of fiber and iron. And when blended up in a food processor, lentils are the perfect base for meatless meatball. Cook green lentils according to package directions. Be sure to use GREEN lentils for the best texture. While lentils are cooking, mix together one tablespoon ground flaxseed meal with three tablespoons of water. Mix together, and let sit for 15 minutes to thicken. I use a flax egg to keep these vegetarian meatballs vegan as well, but you can use a regular egg. 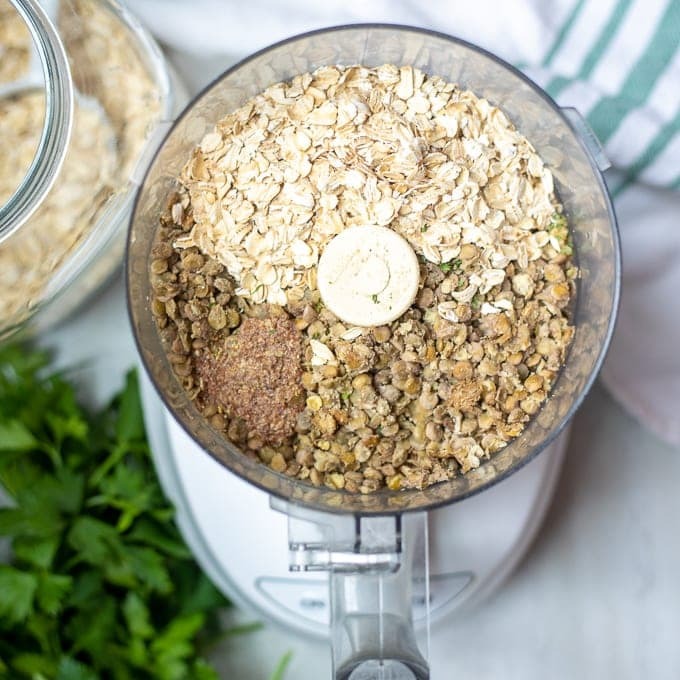 Add lentils, oats, flax egg, and seasonings to food processor. Grease a baking sheet with a thin layer of olive oil. Using a cookie scoop, portion out 1 tablespoon of lentil mixture out and roll into ball and place on greased baking pan. Bake for 15 minutes until meatballs are browned. These Lentil Meatballs are meatless, gluten free, dairy free, and vegan, yet still full of incredible flavor. Prepare lentils according to package directions and allow to slightly cool. While lentils are cooking prepare flax egg by mixing together flaxmeal with water and let sit for 15 minutes. Preheat oven to 400 degrees and lightly brush sheet pan with olive oil or cooking spray. Process lentils, oats, flax egg, red pepper flakes, oregano, parsley, onion powder, pepper, 1 teaspoon salt, and 1 tablespoon garlic together in food processor until just combined. Shape mixture into 1 inch balls and place on baking sheet. Bake for 15 minutes, or until just browned. Serve meatballs with marinara sauce if desired. Feel free to use regular egg in place of flax egg. 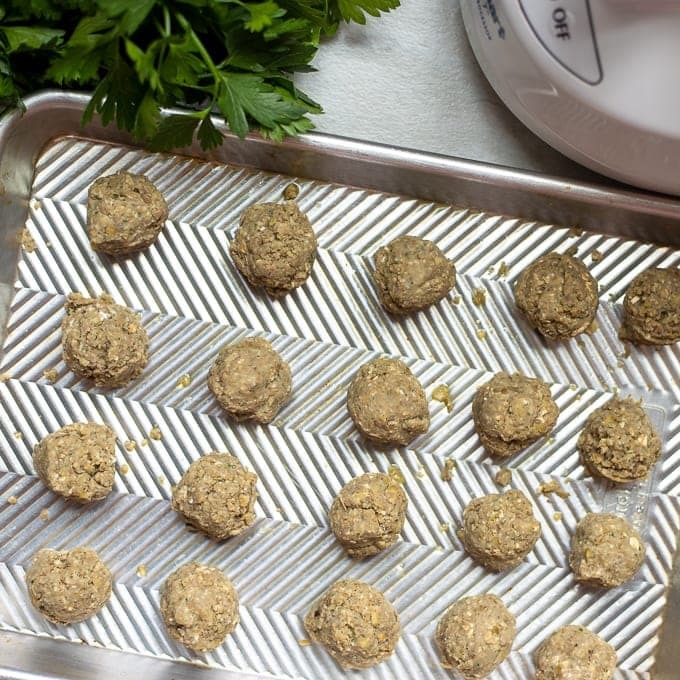 Use certified gluten free oats to keep these meatballs gluten free. Be sure to use green, not red lentils, for the best texture. 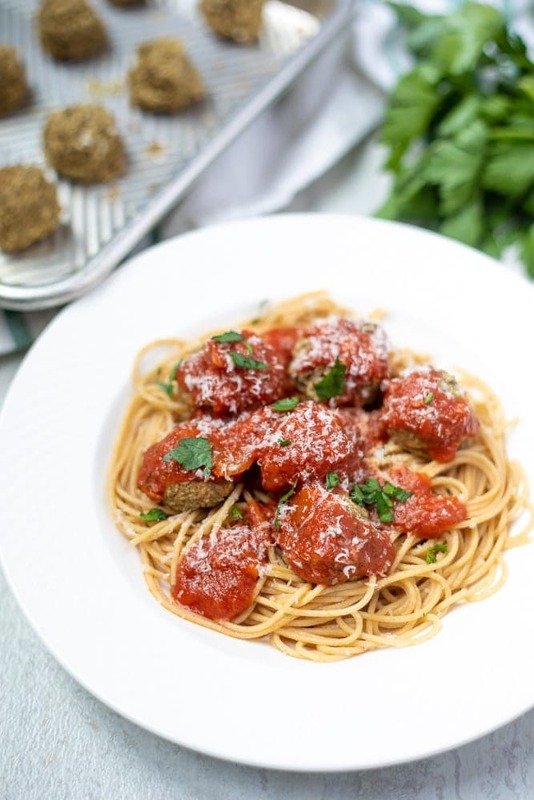 Definitely making this – love that you did lentil meatballs – so creative!! Can’t wait to try it 🙂 Pinned! Thanks Sam, I love that you appreciate my creativity. I hope you enjoy! Absolutely making these! I adore lentils and I love the idea of using flax! I’ve never even thought to make a ‘flax’ egg! YEA!! Let me know what you think Madaline. This looks so good! Lentil meatballs sound perfect! I like to tuck some meatballs away in the freezer and I bet these would freeze beautifully! Majory, they freeze perfectly. Enjoy! I love this idea! Can’t wait to try myself and perhaps do for a client. Would the “meat” balls freeze okay? They freeze wonderfully! Just of course be sure they are in a well sealed container and cooled before freezing. I think they are best to warm through in the oven, but microwave works too! Lentil meatballs are a great idea–I have to try this out! I hope you do–they are great! Yum! These look fantastic. I had no idea the Wynn was so vegan-friendly. Thanks for making these gluten free, too! I was surprised at their embrace of vegan cuisine myself! You bet! This is one dish you must try since you have a spiralizer. This sounds like an awesome dinner! I am going to have to try it! Thanks Paris. Let me know how you like it! I love zoodles so much! I definitely want to try these lentil meatballs. Thanks for linking up to the Bloggers Brags Pinterest Party. I have pinned your post to the Bloggers Brags Pinterest Board. You bet! Zoodles are so fun! Well Michelle, I can pretty much guarantee they will like the meatballs. So if you are worried about the zucchini, just serve them over over regular noodles. Oh lentil meatballs – that’s a new one for me! I’ll have to give them a try. I hope you like them–I think they have a great texture for meatless meatballs. Loved going along on this culinary trip to Vegas Kristen! Great zoodles and meatballs recipe, thank you. I need to buy a spiralizer too, still haven’t succumbed. Guess I’m waiting for a sale! I am waiting for a sale too 🙂 But the food processor works! I have never tried lentil meatballs but I love the idea! Totally feel your pain Gwen. My daughter and I could be vegetarians, but the men–NEVER! However, they did like this recipe. so good! I served mine with organic pasta sauce and baked asparagus. Me and my roommate ate it up. Thanks for the post! WOHOO!!! Love to hear when people make my recipes and enjoy them!! YEA!! Delicious with nice texture… great meatless alternative! These are fabulous! My daughter is vegan but my husband and I eat meat…but everyone LOVED them. New favorite Meatless Monday recipe. WAHOO!!! I love hearing that this pleased the whole family!